Attorney Yoram Sheftel slammed Opposition leader and Labor Party Chair Yitzhak Herzog on Friday, accusing him of betraying the state of Israel. "Again the frightening truth has been revealed, that the Labor party is acting as a fifth column in every sense of the word," said Sheftel to Arutz Sheva. "A day before the meeting of (Prime Minister Binyamin) Netanyahu and (US President Barack) Obama, Herzog of his own initiative met the bitter enemy (US Secretary of State John) Kerry, expressing his support for the US's position against the state of Israel," noted Sheftel, in what he termed "treason." The US position under Kerry includes creating an Arab capital in Jerusalem, as well as massive Israeli withdrawals from Judea and Samaria. Herzog last December expressed his support of that exact position. During his meeting with Kerry last weekend, he urged Kerry to ignore the right and push through the plans. 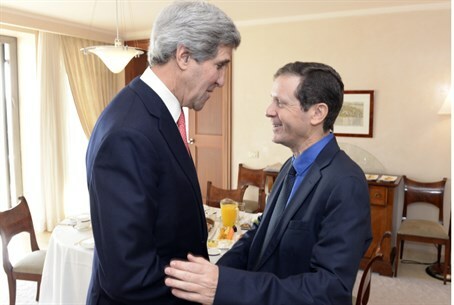 Sheftel argued that by siding with Kerry, Herzog was guilty of treachery towards Israel. "Treason against your homeland is when a certain party identifies with a foreign power that exerts pressure and acts against the interests of your country," charged the attorney. Tying the idea to current events, Sheftel noted "we saw it now in Ukraine with the ousted president (Viktor) Yanukovych and his identification with the Russians who act against his country, that's exactly what Herzog did with the US." In Herzog's call for the capital of the country to be handed to a foreign entity, and for the heartland of the nation to be handed over as well, Sheftel's comparison has some merit; Ukraine is currently seeing its Crimean peninsula being occupied by Russia, which Yanukovych aligned with. The stand off there threatens to spark a possible war through dramatic confrontations. Sheftel dug into the historical causes behind Herzog's acts. He claimed Israeli leftists have never gotten over the 1977 Knesset elections, in which the Israeli right led by the Likud party won a majority for the first time in Israeli political history, taking control from the leftist predecessors of the Labor party. "Since the revolution of 1977, the Israeli left identifies with foreign powers exerting pressure on Israel, and aids them," assessed Sheftel. "Herzog's positions are ten times closer to (Palestinian Authority Chairman) Mahmoud Abbas than to Netanyahu." The attorney predicted that Herzog "will accuse Netanyahu of freezing the peace talks and won't have a single critical word for Abbas. Why? Because the Israeli left always prefers the Arab enemy."